Merritt coming through with a special edition BMXFU edit featuring Charlie Crumlish, Greg Henry, Lee Dennis and Bad Matty getting down at the BMXFU training facility! As always, these guys deliver with some awesome riding, so hit play and check it! This is awesome. BMXFU dug through all their archives and compiled all of Shawn Swain‘s sections from all of the different BMXfu videos over the years. 6 full-length videos worth of parts in one 22 minute video. This spans about 10 years worth of footage, so it’s pretty rad seeing all of this in order. Take a look! You won’t be disappointed! Another day, another fresh video from the BMXFU warehouse sessions. As always, this video delivers on riding and laughs from Charlie Crumlish, Lee Dennis, Greg Henry and more. Take a look! BMXFU – Oh, You Think It’s A Game? The BMXFU crew have been getting plenty of heavy use of their private training facility up in Canada lately. Here’s another fresh mix from the sessions that have been going down! As always, these guys clearly are training for the Olympics with no shortage of top notch riding going down. The BMXFU guys uploaded their full “FU666” video online for your viewing pleasure! Here’s one we did not expect to see online so soon. The BMXFU squad have released their latest full-length video “FU666” online for everyone to check out. This video is just about an hour long and is stacked with amazing riding and some heavy laughs from start to finish. The sound track is even pretty epic… I mean, who the hell else opens up a vide with some classic Kid Rock? Get on that play button. Check out full highlights from the jam the BMXFU crew threw before the premiere of the “FU666” video! 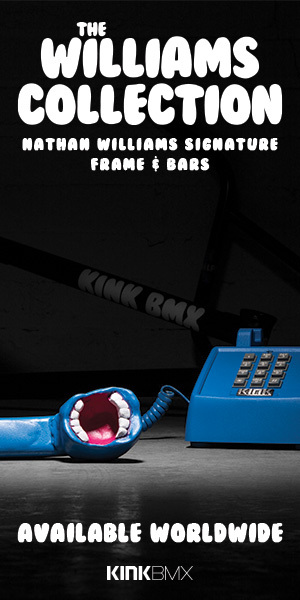 The other week, the BMXFU squad premiered their new “FU666” video at Mission BMX. Before the premiere, there was a jam at the B-Line Bike Park where a bunch of guys got together for a productive session and some good times. Here’s a video showing you everything that went down. “After what seems like forever, the highly anticipated full-length from BMXFU has officially come out. The sixth instalment in the series titled “FU666” premiered in Niagara Falls, Ontario and Calgary, Alberta at Mission BMX on April 21st, 2018. I was stoked to be in Canada during the time and close enough to Calgary to make my way down to hang out with a bunch of great humans. Big thanks to Greg D’Amico for letting me crash at his place for the weekend and to B-Line Skatepark for hosting the jam! A few days ago, Greg asked if I would be able to put together the clips he shot into a little video and this is what I was able to come up with. It was fun getting to play around with some special effects that I normally wouldn’t put to use! The BMXFU squad recently wrapped up their new full-length video “666” and threw a big premiere and jam up in Calgary! Chase Davidson was there with his camera to document all the wild riding and good times that were being had. Here’s a bunch of rad photos from the session at B-Line Bike Park before everyone made their way to Mission BMX shop for the premiere.! Expect more on the “666” video soon! Brad Mulholland – 180 the high jump. Brad Mulholland – 180 over the rail. Deavan Brooksbank with some hops. Deavan Brooksbank putting his tires on the wall. Greg D’Amico with some hops. Landon Quinlan is 11 years old and already shredding. Getting ready for some prizes. Nathan Dowdle stretching a Nac Nac. Double peg to suicide no hander. Richard Gallant sending it in the high hop contest. Travis Kozie with a gap to curved wallride. Travis Kozie has some pop. The winner of the highest hop! Brad Mulholland with a 180 barspin. That wraps up the gallery from the BMXFU “666” premiere in Calgary. Shout out to Chase Davidson for the dialed photos. Make sure you give him a follow on Instagram and keep a look out for more about the “666” DVD soon!